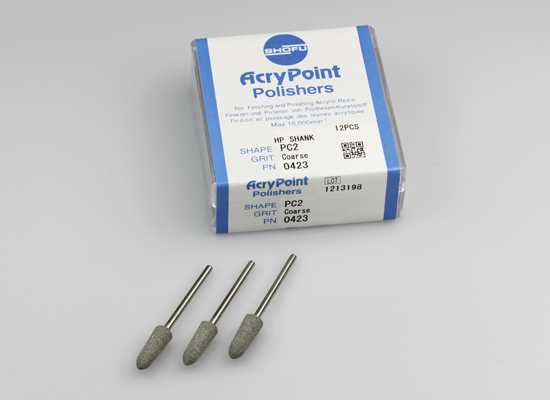 The AcryPoint silicone polishers are designed for adjusting, finishing and polishing of acrylic dentures, all acrylic appliances and acrylic impression trays without the need to use additional polishing pastes. The coarse dark grey AcryPoints are used for adjustments. The brown AcryPoints with medium grit size are designed for finishing and prepolishing. The light grey AcryPoints with fine grit size are recommended for polishing.